With things as expensive as they are now , we all need to find cheaper, but natural ways to preserve our beauty . Skin Care: Coconut oil is an excellent massage oil for the skin as well. It acts as an effective moisturizer on all types including dry skin. 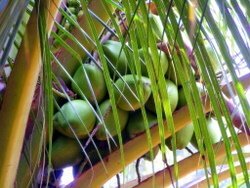 The benefit of coconut oil on the skin is comparable to that of mineral oil. Further, unlike mineral oil, there is no chance of having any adverse side effects on the skin with the application of coconut oil. Coconut oil therefore is a safe solution for preventing dryness and flaking of skin. It also delays wrinkles, and sagging of skin which normally become prominent with age. Coconut oil is also helps in treating various skin problems including psoriasis, dermatitis, eczema and other skin infections. Therefore coconut oil forms the basic ingredient of various body care products such as soaps, lotions, creams, etc., used for skin care.